I'm inspired with the setup of this design studio TILT has created which they called OpenBook. 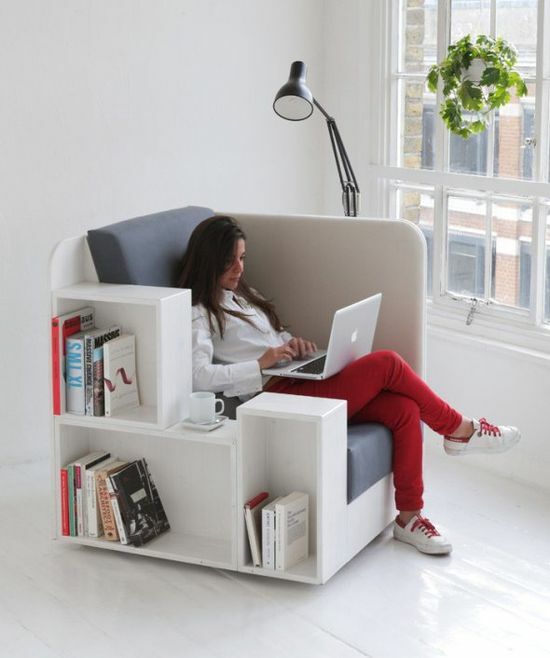 This furniture is a combination of a seat, coffee rest and a library. It's so conducive to working and perfect for a work-at-home person like me where I can place my books and stuff at an arms lenght and have coffee at the side while doing my online writing tasks. Working online is not that easy and so is writing article but when you love your work and has become a passion you'll love every minute of it. Well if the work is getting hard you could think of something like this featured furniture to perk up your zest and excites your mood. Remember that a cozy and beautiful place of working inspires a person to work and when you're a writer you need a lot of inspiration to think and write. Design studio TILT has created OpenBook, a piece of furniture that is a seat, coffee-rest and a library.